The Israel Internet Association is the official Israeli Chapter of the Internet Society. Their annual meeting is a central event of academics (sociologists, psychologists, business and law) as well as industry participants from sectors including mobile cellular companies and internet service suppliers. Abstract: Social media systems on the Internet are sociologically interesting: why do some online groups succeed where others fail? How do different collections of online media and populations of authors differ from one another? How do patterns of contribution vary and how do these differences illustrate the roles people play within their communities? Several visualizations of patterns of contribution and connection in a range ofInternet social media including web boards, enterprise social networks services, and personal email are presented to illustrate the range of variation among social media repositories and between types of contributors. These images suggest that a more comprehensive overview of social media can generate sociologically relevant findings, improve community management tasks as well as provide features that can improve search and ranking of user generated content. 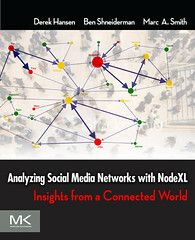 A freely available tool, NodeXL, will be demonstrated to perform basic social media analysis tasks. Extending these tools to include mobile social software (“mososo”) data sets is a major new direction. In the not too distant future, mobile devices will possess a range of sensors and become more “socially aware”. When phones routinely notice each other the nature of social interaction will change dramatically. How will places and locations change when machines become socially aware? In this talk, sociologist Marc Smith, Chief Social Scientist for Connected Action Consulting Group, a provider of social media analysis platforms and services, will describe these new technologies and some ways of thinking about their implications.